1. Body of teachers whose office was to interpret the Law to the people, their organization beginning with Ezra, who was their chief, and terminating with Simeon the Just. 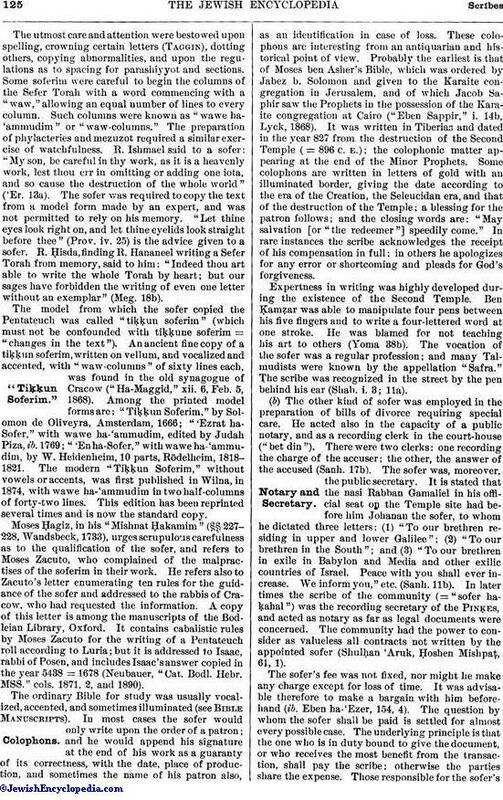 The original meaning of the Hebrew word "soferim" was "people who know how to write"; and therefore the royal officials who were occupied in recording in the archives the proceedings of each day were called scribes (comp. II Sam. viii. 17; II Kings xix. 2, passim); but as the art of writing was known only to the intelligent, the term "scribe" became synonymous with "wise man" (I Chron. xxvii. 32). Later, in the time of Ezra, the designation was applied to the body of teachers who, as stated above, interpreted the Law to the people. Ezra himself is styled "a ready scribe in the law of Moses" (Ezra vii. 6). Indeed, he might be correctly so called for two reasons, inasmuch as he could write or copy the Law and at the same time was an able interpreter of it. 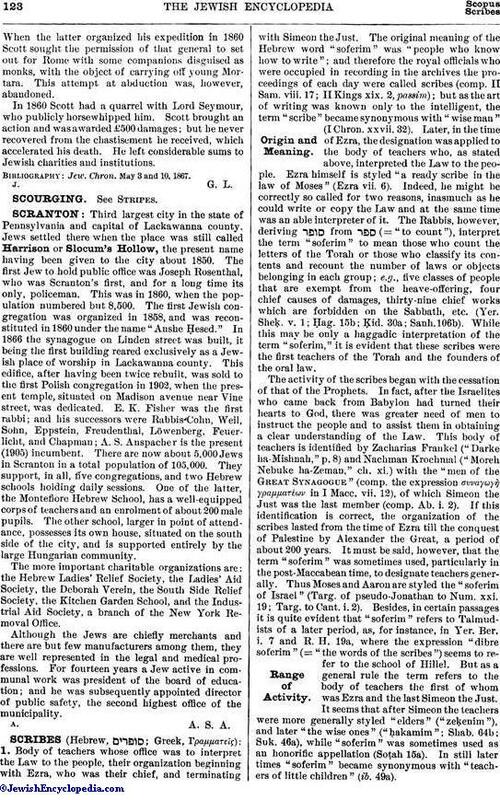 The Rabbis, however, deriving from (= "to count"), interpret the term "soferim" to mean those who count the letters of the Torah or those who classify its contents and recount the number of laws or objects belonging in each group; e.g., five classes of people that are exempt from the heave-offering, four chief causes of damages, thirty-nine chief works which are forbidden on the Sabbath, etc. (Yer. Sheḳ. v. 1; Ḥag. 15b; Ḳid. 30a; Sanh. 106b). While this may be only a haggadic interpretation of the term "soferim," it is evident that these scribes were the first teachers of the Torah and the founders of the oral law. From the time of Ezra, however, the scribes occupied themselves also with plans for raising Judaism to a higher intellectual plane. They were, consequently, active in reviving the use of Hebrew, which had been to a great extent forgotten during the exile in Babylon, and in giving it a more graceful and suitable script. As to the latter, it is stated that the Torah had first been written in Hebrew characters; then, in the time of Ezra, in characters called "ketab ashshuri" (probably = "ketab suri" = Syrian or Aramean script; comp. Kohut, "Aruch Completum," s.v. ), the present square type, the former script being left to the "Hedyoṭot," that is, the Cutheans or Samaritans (Sanh. 21b-22a). 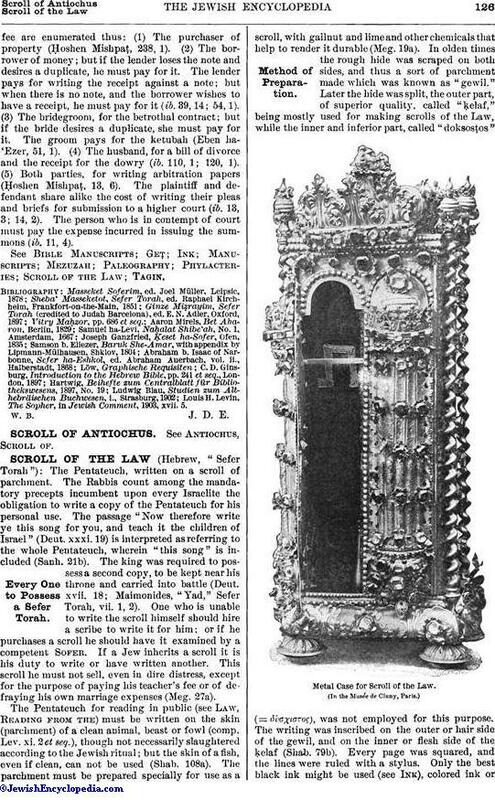 It is evident that the scribes, in making this change, wished to give the Torah a particularly sacred character in distinction to the Samaritan Pentateuch. The term "ketab ashshuri" is explained by one authority as meaning "the even writing" (Yer. Meg. i. 71b), as contrasted with the forms of the ancient Hebrew or Samaritan characters. 2. The professional scribes, known also as "liblarin" ("liblar" = "libellarius"). 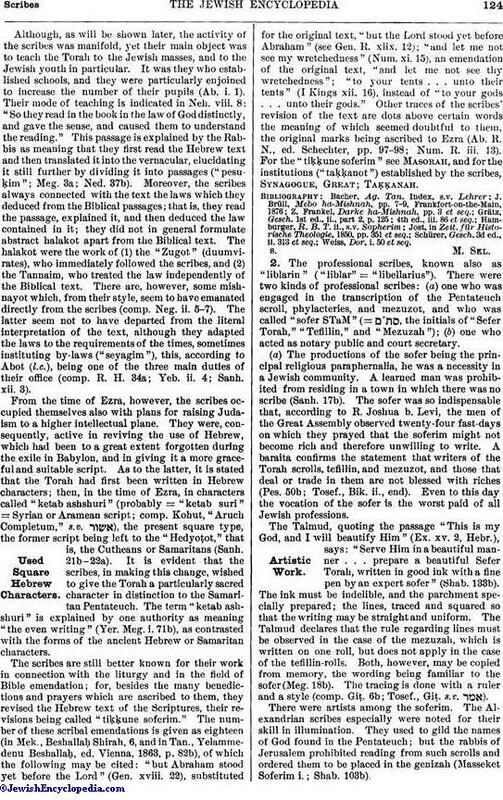 There were two kinds of professional scribes: (a) one who was engaged in the transcription of the Pentateuch scroll, phylacteries, and mezuzot, and who was called "sofer STaM" (= , the initials of "Sefer Torah," "Tefillin," and "Mezuzah"); (b) one who acted as notary public and court secretary. (a) The productions of the sofer being the principal religious paraphernalia, he was a necessity in a Jewish community. A learned man was prohibited from residing in a town in which there was no scribe (Sanh. 17b). The sofer was so indispensable that, according to R. Joshua b. Levi, the men of the Great Assembly observed twenty-four fast-days on which they prayed that the soferim might not become rich and therefore unwilling to write. A baraita confirms the statement that writers of the Torah scrolls, tefillin, and mezuzot, and those that deal or trade in them are not blessed with riches (Pes. 50b; Tosef., Bik. ii., end). Even to this day the vocation of the sofer is the worst paid of all Jewish professions. The Talmud, quoting the passage "This is my God, and I will beautify Him" (Ex. xv. 2, Hebr. ), says: "Serve Him in a beautiful manner . . . prepare a beautiful Sefer Torah, written in good ink with a fine pen by an expert sofer" (Shab. 133b). The ink must be indelible, and the parchment specially prepared; the lines, traced and squared so that the writing may be straight and uniform. The Talmud declares that the rule regarding lines must be observed, in the case of the mezuzah, which is written on one roll, but does not apply in the case of the tefillin-rolls. Both, however, may be copied from memory, the wording being familiar to the sofer (Meg. 18b). The tracing is done with a ruler and a style (comp. Giṭ. 6b; Tosef., Giṭ. s.v. ).